Use the form below to upload Video Award submissions (Promote Award and/or Compass Award) for the 2018-19 North Texas FTC Regional Championship. Location: Flower Mound High School Cafeteria. However, if you cannot find that, come through main entrance. Contact Guido Climer to register or inquiries. The Regional FTC Championship for North Texas will be held on February 23, 2019, at Wylie East High School in Wylie, Texas. Forty-eight teams will be competing for awards and a chance to attend the FTC World Championship in Houston, Texas in April 2019. We’re looking for volunteers for this huge event! Apply to volunteer at https://my.firstinspires.org/Volunteers/Wizard/Search/2?EventId=39848 , or see the Volunteer page for more information about the available volunteer opportunities and how to apply. Overall, keep in mind that this is a championship-level tournament which means that teams will be performing at a higher-level throughout the day and potentially at a faster pace than qualifying tournaments. We expect teams to know where they should be and when, to proactively and promptly appear for judging, robot inspection, and matches so as to keep things moving smoothly, and to exhibit Gracious Professionalism throughout the entire event with other teams, volunteers, event officials, and spectators. Our previous message to teams contained specific notes regarding robots and inspection — be sure to review and address any issues prior to arriving on Saturday. We never like to have a robot fail inspection, but the size and time constraints of this event means we may not have as much flexibility to “hold” inspections open as is sometimes done at earlier-season events. With respect to judging, we encourage all teams to re-review the Award Descriptions in Game Manual Part I, section 10 — especially those bolded sections regarding the required elements of the Engineering Notebook (section 10.2.4). Judges will be following these requirements closely, and will be looking for clear examples of Engineering Design Process via the Notebook. Also, a note for veteran teams: Note that the distinctions between Connect and Motivate are now better delineated than in previous seasons. Some activities that teams have previously identified as applying towards the Connect Award are now more closely aligned with the Motivate Award. The judges have also asked us to advise teams with multi-year or multi-team coordinated efforts to clearly differentiate the work of this year’s team from past team efforts or those of partner teams. For robot and field inspection, robot inspection is likely to be more rigorous than what you may have experienced at a qualifier. Robots that are unable to pass inspection by the end of the inspection period will be unable to participate in qualification matches. And the fact that an inspector passed (or overlooked) a robot at a previous event doesn’t mean it will pass at the Championship. An event with only three advancing teams can arise with from small events. It’s tempting to look at advancements in terms of percentages (3 teams from a 15-team event is a 20% advancement rate), but that masks the reality of what happens at a 3-team advancing event. * The Inspire Award Winner, Inspire Award 2nd place, and Winning Alliance Captain all advance. * The Winning Alliance 1st team selected advances only if the Winning Alliance Captain also receives Inspire 1st or Inspire 2nd. It happens, but it’s by no means certain. * The Inspire 3rd team advances only if both of the Winning Alliance teams received Inspire 1st and Inspire 2nd. Count your lucky stars if this ends up being you. * None of the other awards advance. Yes, a 3-advancing team event means that a team can be on the Winning Alliance — even undefeated through all matches — and still not advance. An event where only three teams advance can have a very definite impact on Alliance Selection. If your team is in line to be an Alliance Captain (i.e., it is one of the top four ranked teams), and a higher-ranked team asks you to join their alliance, you may very well want to consider declining the invitation so you can become the captain of your own alliance. If you accept the other team’s invitation and they don’t win Inspire 1st or Inspire 2nd, then you don’t advance even if your alliance ends up winning the tournament. If you think by declining and forming your own alliance you may beat whatever alliances they and other higher-ranked teams come up with (remember, they all get to pick before you do), then being (Winning) Alliance Captain means you get to advance. If you’re not in line to be an Alliance Captain when Alliance Selection rolls around, then your only path to advancement is to win the Inspire Award or Inspire 2nd place, or lobby/hope to end up on the Winning Alliance with an Alliance Captain that does win one of those awards. Advancement opportunities are extremely limited in an event advancing only three teams. At first glance advancing 3 teams from a 10-team event may seem better “percentage-wise” (30%), but a 20-team event advancing 5 teams (25%) or even just 4 teams (20%) has many many more opportunities for advancement. We are always looking for volunteers for FIRST Tech Challenge events in the North Texas Region. Volunteers can take a variety of roles, including Judges, Referees, Score Trackers, Inspectors, Hospitality, and more. Judges select team award recipients through interaction with teams. Documentation regarding team background information is provided to familiarize judges with teams. • Interview and observe teams in the judging rooms, the pit, and on the playing field. Judging is generally an all-day commitment; the morning is spent interviewing teams and after that the judges deliberate and visit individually with teams to determine event winners. Robot Inspectors and Field Inspectors are responsible to ensure every robot follows the guidelines outlined in FIRST Tech Challenge Game Manual Part 1 and are ready to compete on the field. The inspection process involves filling out a checklist for every robot and placing a label or other unique tag on the robot after it passes inspection. Inspections generally take place in the early morning and are finished before matches begin (usually around 10:30am), which means that Inspectors can also volunteer to be Referees or Score Trackers. Referees observe team matches, identifies rule violations, and “call” them. Referees help the competitors to avoid breaking the rules of the Game. Referees participate in deliberations regarding contested calls, working directly through the Head Referee. Referees are needed when matches start (usually around 10:30am) and for the remainder of the event. Referees can also volunteer as Inspectors. There are many more roles available, including Announcers, Queuers, Runners, Registration / Checkin, Hospitalit, and more. To volunteer at a North Texas FTC event, see the guide at https://www.firstinspires.org/sites/default/files/uploads/resource_library/volunteer/volunteer-registration-step-by-step-guide.pdf . Essentially the steps are to create a FIRST account at https://www.firstinspires.org/ways-to-help/volunteer/event-volunteers. FCA will be hosting an FLL INTO ORBIT Robot Games scrimmage on Saturday, November 3rd. A maximum of 20 teams will be allowed to participate in the scrimmage. Sign-up for the scrimmage is first-come, first served. Admission is free and non-participating teams and other spectators are welcome to come and watch as well. Visit the FCA Robotics website for more details. This is a North Texas FTC Qualifying Tournament scheduled for Conrad High School in Dallas, Texas. To volunteer at this event, see https://my.firstinspires.org/Volunteers/Wizard/Search/2?EventId=40474 . Teams can (pre)register or waitlist for this event at http://roboplex.org/ftc/registration . 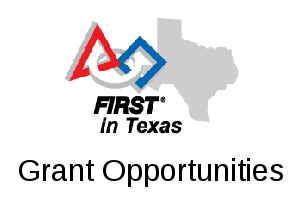 Pre-registration for North Texas FTC Qualifying Tournaments will open on September 28 at 11:00am CDT. When pre-registration opens, teams will be able to fill out an online form to indicate their preferences for qualifier events in the season. Completing the form does not register a team for any events, it simply establishes a team’s priority claim for available event slots. No payment for event fees is needed for pre-registration, and events will be generally assigned to teams based on the order of form responses and availability of preferred event slots. January/February Qualifiers: In order to provide all teams with an opportunity to compete in a January or February event, pre-registration will give each team a reservation for ONE qualifier taking place after January 1st based on their preferences. In mid-December we will then open up waitlists and registrations for any events with unclaimed registration spots. November/December Qualifiers: Teams that wish to compete at a November or December event can also use the pre-registration form to indicate their preferences. Teams have the option to choose a second Nov/Dec event instead of a Jan/Feb one. As event assignments are made the team contacts will receive “reservation tickets” for their assigned events; the reservation tickets will contain instructions about completing registration and payment options for the events. 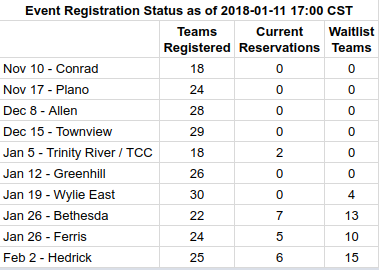 Unclaimed reservations will expire a few weeks prior to the event date and the spots released to other teams on waitlists or that request additional events. Teams intending to compete in a league (Waco or El Dorado) should contact the League Coordinator for registration details, or email Patrick Michaud at patrick.michaud@utdallas.edu. Note: This information is for FIRST TECH Challenge (FTC) teams in North Texas. FIRST LEGO League teams should get qualifier information from the Perot Museum FLL website . Event preregistration has closed. We are now allowing teams to waitlist for any event spots that become available. If you would like to get additional events for your team (or if your team hasn’t received any events yet), you can fill out the form at http://roboplex.org/ftc/waitlist to request to be added to waitlists for remaining events. Within each priority group, any available spots will be allocated by lottery. In general, teams getting an event invitation from the waitlist will need to either accept the invitation quickly (usually within a 2-3 days) or we will pass the invitation on to the next team. We will make our best effort to notify teams as soon as possible that an event spot has opened up, but sometimes spots open up at the “last minute” and so you may receive an invitation to an event on short notice. If you get a event invitation from the waitlist and end up declining it, your team will still be considered for available spots at other events. January/February Qualifiers: In order to provide all teams with an opportunity to compete in a January or February event, pre-registration will give each team a reservation for ONE qualifier taking place after January 1st based on their preferences. In December we will then open up waitlists and registrations for any events with unclaimed registration spots. For more information about qualifier registration, contact patrick.michaud@utdallas.edu . This is a North Texas FTC Qualifying Tournament scheduled for Hedrick Middle School in Lewisville, Texas. To volunteer at this event, see https://my.firstinspires.org/Volunteers/Wizard/Search/2?EventId=39822 .